Looking for an epic culinary experience in Spain? Join Foodies in the city as they take you on a market tour, paella cooking, and olive grove tour adventure in Madrid. Discover fresh ingredients and learn to cook authentic traditional Spanish dishes and find the most hidden culinary secrets of the Spanish culture. Join for a delectable cultural and gastronomic hands-on experience preparing Spanish dishes and drinks! You will be staying in the deluxe view rooms of Dear Hotel in Madrid. Dear Hotel is a design boutique hotel in the heart of Madrid, with stunning views over Gran Via and Plaza de España. You will be able to enjoy a roof top restaurant and lounge terrace with sky pool. All rooms are with views and exclusive nordic decor. Deluxe view room is designed for travelers that want to enjoy a luxury stay while still feeling at home. All have excellent views and top acoustic isolation. 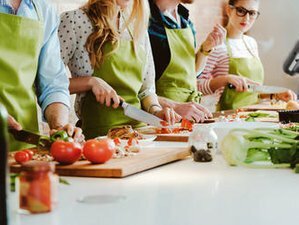 This will be a unique hands on Spanish cooking class with a tour market, where you will discover the secrets of the Spanish traditional cuisine. You will start with a fascinating visit to Mercado de los Mostenses, a local food market where locals go for their daily shopping. After buying the fresh and organic ingredients, you will head to an apartment located next to the Royal Palace where you will participate in a four-hour fun, hands-on Spanish cooking class. ​You will be involved from the very first minute on the elaboration of a paella, by preparing all the ingredients and then firing up the gas. This interactive, informative, and extremely appetizing process will teach you everything you need to know about cooking the perfect Spanish paella! ​While your main dish is simmering away in the pan, you will prepare a gazpacho and some tapas like chorizo with cider, catalan bread and tortilla española. Finally, Foodies in the city will host a sangria making workshop, allowing you to mix your own fresh and fruity jugs of the classic Spanish refreshment to enjoy with your meal. ​You will then sit down to enjoy the homemade dinner with a delicious dessert. You will be provided with the paella recipe. Please note that a vegetarian option is available upon request. After the cooking class, you will head to a flamenco show to enjoy a very traditional Spanish performance. Next day, you will participate in a stunning local olive grove tour, tasting session, and lunch in the countryside, one hour away from Madrid. The tour will be led by Guillermo and Laura - Spain’s newest generation of olive farmers. In 2013, these two biologists took over the family business and embarked on an innovative mission: to connect the local countryside with the city of Madrid and make farming a sustainable way of life once again. You will depart from Madrid in the morning by bus and head towards the stunning olive grove located in a small town close to Toledo. Once there, you will meet up with Guillermo and Laura who will lead you around their oldest plot and explain the process of creating olive oil: from planting and harvesting to filtering and bottling. After the walking tour, you will sit down at a shaded table nestled idyllically among the centenarian trees. It is time for the olive oil tasting, where you will have the opportunity to taste some of the oil they have made. There, you get to sample several kinds of olive oil from little blue glass cups. As a further treat, you will be delighted with a special lunch between olive trees with some delicious food and wine that have been locally grown and produced. At the end of the session, you will be able to distinguish between the generic oils you find in the supermarket against the top quality organic ones. Today is the final day of your culinary tour. This culinary tour will take place in Madrid, Spain. Breakfast would be provided on all days. Your breakfast will include top artisan fresh products buffet and á la carte hot dishes. Your hotel provides a singular buffet breakfast with freshly squeezed juices, seasonal fruits, artisan products, a selection of top coffees and herbal teas, and your choice of à la carte hot dishes of the day. Welcome drinks will also be served upon your arrival. In this holiday, you will experience a hands-on paella cooking class with a local couple who will show you the most hidden gems of the Spanish cuisine. It will be followed by meals with some tapas, wine, water, and dessert after the lessons. You will also partake in a local olive grove tour which includes a tasting session and a dinner in the countryside and surrounded by olive trees on a perfect landscape location.